Merciful and everlasting God, You did not spare Your only Son but delivered Him up for us all to bear our sins on the cross. Grant that our hearts may be so fixed with steadfast faith in Him that we fear not the power of sin, death, and the devil; through Jesus Christ, our Lord, who lives and reigns with You and the Holy Spirit, one God, now and forever. Amen. 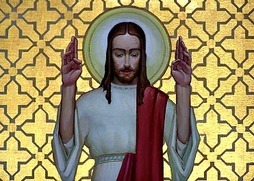 Liturgical Season — White and gold will don the altar this Sunday in joyful celebration of the Resurrection of Our Lord. Explore the beauty of the Church Year. Listen to livestream — villagelutheranchurch.org. Listen by telephone — Call 1-800-457-9860. When prompted, enter passcode 8109865#. Listen on demand — Divine Services are archived here. Sermons and Bible Studies are available as a podcast through your preferred podcast service (search for "Village Lutheran") or by clicking here. Vacation Bible School (ages 3-10) is scheduled for June 10-14, 9am-noon. Volunteers may sign up in the lounge. Parents may also sign up children in the lounge. Have you ever wondered how you can best form your family in the Christian faith? Beginning Sunday, April 28 you can explore the possibilities during the adult Bible study hour in the northeast preschool room. Models needed for photography/painting series of families living everyday life in the home. The joys and challenges of being a parent and being a child of God. No modeling experience needed. Dads are welcome too. All ages welcome...grandparents, teenagers, adult children, couples, pregnant mothers. For more information please contact Kelly Schumacher (314)-616-6868. Village members are welcome to attend the wedding of Brian Albrecht and Anna Karsten on Saturday, May 4, 3 pm at Village. They will greet guests at a light reception in the fellowship hall following the service. Let us join them in rejoicing as Christ unites them. Laura Jostes will be commissioned as deaconess and installed as Village's deaconess on during the 10:45 service on Sunday, May 5. The adult Bible study hour will include a reception to celebrate the occasion. Let's congratulate her with a card shower as part of the occasion. Deaconess Laura Jostes has secured access to modules to assist you in speaking the Gospel to family and friends of various backgrounds. Contact her to obtain access to those modules. One of the most joyful days each year on our seminary campuses is Call Day when vicars and deaconess interns receive their assignments and when pastors and deaconesses receive their first calls. Village will be doubly blessed this year as we receive an intern and as Deaconess Laura Jostes is officially called. Join the festivities at Concordia Seminary on Wednesday, May 1, at 3 pm for the vicarage assignment service and at 7pm for the call service (including Deaconess Jostes). Laura Jostes will be commissioned as Deaconess and installed at Village on Sunday, May 5 at the 10:45 service. The adult Bible study hour will include a reception to celebrate the occasion. You can listen to sermons and both Sunday morning Bible studies as podcasts. Search for "Village Lutheran Podcast" in your preferred podcast service. You can also find the feed here. The Village website will have a link embedded as well. For those who are ill, injured, hospitalized, homebound, or recovering, especially Dennis, Catherine, Carol, Stephanie, Dan, Peter, Tom, John, Kent, Jackson, Judy, Amber, Maxine, Doris, Valerie, Jim, Susan, Al, Jennifer, Alison, Rick, Dave, Jim, Penny, London, Paxton. For those who suffer from dementia or other mental illness, especially Allan, Jan, and Luke. For those outside the faith that the Spirit would bring them to faith, especially Ken and Michael. For our community, its civic leaders, government officials, educational institutions, and residents. For the students, faculty, and staff of Washington University as we carry the Gospel to them. For the students, family, and faculty of Village Lutheran Preschool that they would be strengthened in faith. Luke 22:11 – “Tell the master of the house, ‘The Teacher says to you, Where is the guest room, where I may eat the Passover with my disciples?’ ” Did Jesus really need this man’s Upper Room? If the man had refused to let Jesus use it would the work of salvation have been derailed? Of course not. But what an honor for the man who owned this room! It is likewise with us. The Lord needs none of us, but what an honor for God to choose to use our generosity in the work of His Church. John 12:12-19: No matter whether you celebrate Jesus riding into Jerusalem or His Passion, the message is clear: Jesus came to Jerusalem to die for the sins of the world! Because of that, we have hope for ourselves and plenty of additional hope to share with fellow sinners. That truth gives us reason to wave a palm branch in bold faith and in thanksgiving to God that there is one true King who conquers sin, death, the grave and the devil, and only one true King worthy of all our praise, thanksgiving and daily witness. ​Weekly offerings may be made via automatic electronic funds transfers to Village Lutheran Church. Submit a simple registration form to start; changes may be made at any time. Village also accepts stock donations to our brokerage account and IRA Qualified Charitable Distributions (QCD) sent directly to Village. Email Village Bookkeeper Ken Pranschke for details.